The picturesque Barga is located in the province of Lucca, 410 meters high on top of a hill overlooking the middle valley of the river Serchio. In summary, 10 thousand inhabitants, a rich history, beauty, gastronomy, ties with Scotland (yes) and much more, including a beautiful jazz festival always very popular. 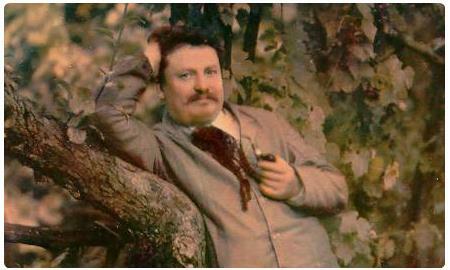 Giovanni Pascoli remembered it well, when on 27 September 1896 he wrote "I was looking for a secluded and solitary place a year ago. I saw that there was beauty and I stopped". The spirit of this place located in the middle valley of the river Serchio, goes beyond the numbers. Barga, which is like the heart of the Florentine or Grand Duchy Garfagnana, so called because, although it belongs geographically to the valley mentioned above, was politically separated from it from the end of the early Middle Ages. Many popular awards to the town, including that of the 'most beautiful villages in Italy', or 'Slow City'. 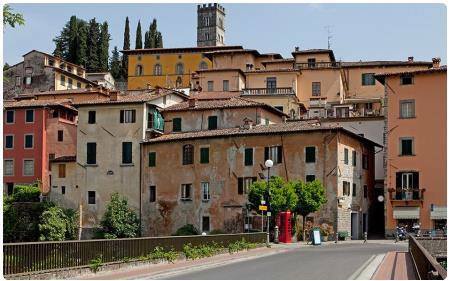 Another curiosity is the fact that Barga is known as the "Scottish city" of Italy. This is because many people emigrated to Scotland in the last century and today, their descendants come to visit their origins and so it is not uncommon to find Scottish tourists on the streets. 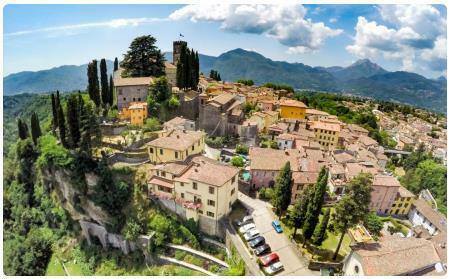 In Barga history embraces the vicissitudes of an area that is at times impervious, isolated, very beautiful, true; it was a Lombard feud, but even before it was the stronghold of Ligurians and then a Latin outpost with the Romans. A small town full of historical events and beautiful things to see and do. Ideal place to 'stop', but also to move around and see what else is around. 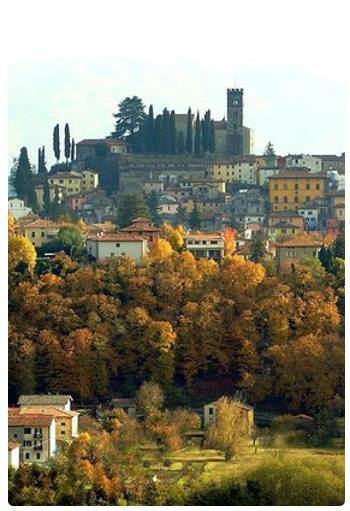 Barga is a typical Italian village. It is located on top of the hill Romeggio, hilly territory that pours on the plain of Lucca, a city from which is about 40 km (all to do not really fast, even to admire the landscape and mountains of Garfagnana). Some might prefer to visit it for a short day trip, perhaps even from Florence or Pisa (90 and 55 km respectively), others would prefer to savor the most intimate secrets and stay there for longer. This is what we are going to do, a short overnight stay that possibly will make us understand how this small place has also attracted over time a large number of foreigners, including several British (perhaps Scottish accent), and artists, and then it is the desire to learn more about the ancient academy, called 'dei differenti', founded in the distant seventeenth century and arrived until the twentieth century in the presence of the greatest Italian prose. 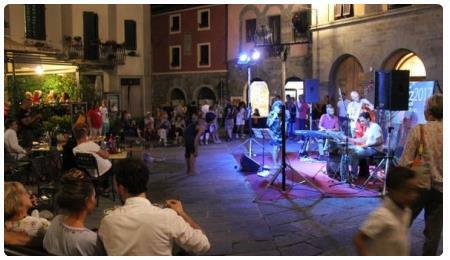 The atmosphere remains almost secret in Barga. 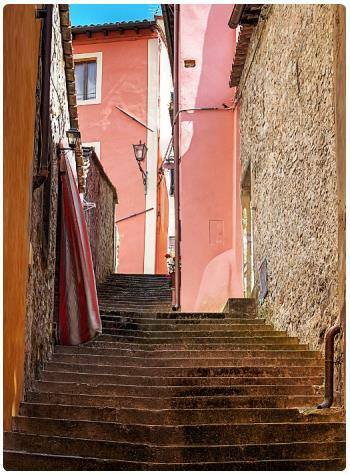 In the narrow alleys and stairways, you can breathe in a special air, far from the incensant heat. The urban structure proposes two distinct areas. One with the oldest and the other more recent appearance, joined by a bridge, that of Viale Giovanni Pascoli but dedicated to the heroes of Barga who fell in 1918, Leo and Corrado Lombardini. You can admire the contrast: the green of the vegetation just to the side and the color of the oldest buildings, in the upper part of the village. There is also a red all-English cabin on the side of the road, and it's no surprise (in recent years many British and Americans have bought properties here and it's easy in the summer to meet more foreigners than Italians). Arriving by bus from Lucca (take it from Piazzale Verdi) you reach the destination entering from Porta Reale (also called Mancianella), on the other side of the oldest village. The medieval Barga was in fact divided into three so-called "tertiers", to whom three doors of the castle referred: Porta Mancianella also called royal (as above), Porta Macchiaia also called Porta Latria, and Porta di Borgo. Inside between them we find the houses of the once rich people, who still bear a name. It was a good period when, as a free Commune of the Marquisate, also favoured by the countess Matilde of Canossa, Barga obtained the privileges from the emperor Frederick I (in italiano known as Federico Barbarossa). There have been several historical characters linked to Barga, as well as battles to grab or escape the dominion of one or another city. Pisans, Lucca, Florentines, to whom the last Barghigiani allied themselves and from whom they received economic benefits such as to achieve a long period of prosperity. In fact, it was the tax exemptions obtained by the Florentines on the trade of raw materials (in particular sold to the Estensi and the Lucchesi), which allowed the development and opening of new activities. The construction of Renaissance palaces is the most immediate visible result, among these are those that bear the name of the Pancrazi, Bonanni, Bertacchi, Salvi, Turignoli, Orlandi. And on the subject of exemptions, these were important concessions, part of a custom established in Barga, when one considers that there was already an exemption on the tax on the register (the tax office, as it was called), the exemption on the millstone, the general price of salts, the contract for tobacco (it is documented that in this regard, cultivation and production remained free). Then there was the exemption for the manufacture of playing cards and many others, including the one that freed the people of Barga from paying duties on products transported and collected at the port of Livorno. It is certain that what was once a territory full of taxes if their exemption favoured the development of a small village like this. Last but not least, it should be considered that the development of some gunpowder factories in the Barga area was possible thanks to the exemption of the hunting dust royalty. The bond with Florence lasted until the Napoleonic occupation, interrupted only in the failed attempt to 'bomb' the walls of Barga by a leader in the pay of the Visconti of Milan, certain Piccinino, to whom the Florentines opposed another famous leader, Francesco Sforza, who in fact freed Barga from siege. The unification of Italy in the second half of the 19th century did not benefit Barga, which in fact became impoverished by the abolition of exemptions by Piedmontese and the consequent reduction in trade with neighbouring territories. Many people began to leave the country and migrate elsewhere, especially to England and America. The country emptied itself, almost frozen in its past history. However, some time later, a migration to the contrary took place and two characters in particular represented the prelude: Giovanni Pascoli and John Bellany, the former poet, the latter painter. Two different historical periods, same passion for Barga, as it happened more recently for other names such as those of Susan Sarandon or Paolo Nutini among others. Giovanni Pascoli set up his home in Barca, and more precisely in Castelvecchio di Barga, living from 1895 to 1912 in what is now known as the Pascoli museum house. A place he dreamed of, beautiful, relaxing, he would say, where he could admire the Apuan Alps and the Apennines, on the other side of his native San Mauro di Romagna, on the other side of his life until then. It was here that he had the opportunity to compose the Songs of Castelvecchio, the Primi Poemetti and the Poemi Conviviali, among other things. Bellany came from Scotland, where she was born in 1942. 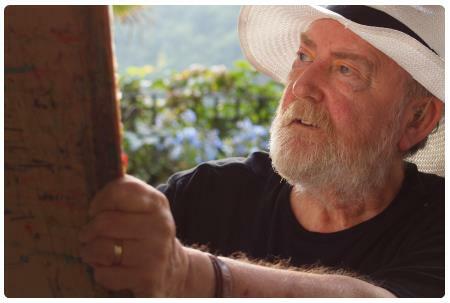 He died in 2013 and took up residence in this land, as if it were a new Provence, a source of inspiration full of light and unusual moments of art. He said that in Barga he had the feeling of being in a timeless place "...it could be 1520 or it could be last Thursdy" (it can be 1520 or last Thursday)". He loved this place for its timelessness and today Piazza Angelio in Barga recalls the artist with a plaque. 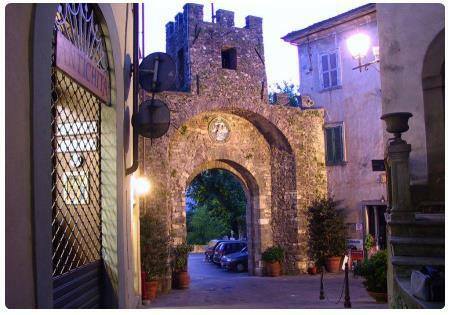 Walking through the streets of Barga you can admire several historical monuments. Continuing and after entering the oldest part of the town from Porta Reale, you cross a system of streets with irregular plans. There are alleys and cariers. Squares, palaces, churches and monasteries. The church of Santa Elisabetta became a conservatory, but was inhabited in the fifteenth century by the Poor Clares, inside you can admire a very beautiful work, an altarpiece of the Della Robbia school, as well as other fine artistic expression. A wide ramp of stone steps leads us to the Collegiate Church of San Cristoforo (Duomo di Barga) and to an equally large panoramic terrace from which you can admire the roofs of the houses below, the green hills, some farmhouses and in the background the mountains. The church is in Romanesque style, built with local stone, from the eleventh century. Inside you can admire different ornaments: the holy water stoups of the twelfth century, the fragment of a fresco, a baptismal font, statues and then chapels housing precious Renaissance works. Other important monuments follow, including the Palazzo Pretorio, the church of the SS Crocifisso, the Via di Mezzo lined with ancient buildings, the Loggia del Mercanti that refers to the sixteenth-century market, established by Cosimo I de Medici, the Palazzo Pancrazzi. Further on there is the Theatre of Differenti, to which we would like to devote more attention in a separate section. The surroundings are also convincing, with the church of San Francesco and its beautiful glazed terracotta, probably by Della Robbia, or with the Parish Church of Santa Maria a Loppia, a hamlet in the municipality of Barga. In the evening, when the light becomes more subdued, Barga is appreciated even more. It will be for that musical note, which from the second half of August accompanies and cheers, or attracting jazz music lovers from around the world. On the facades of noble palaces you will notice anthropomorphic figures, which are said to have been put there because they were propitiatory of fertility. They are usually given a lot of attention by expressing a wish while holding down the index finger and middle finger of their right hand on them. Legend often comes true.